Apple is reportedly preparing to refresh the iMac lineup next week, though changes expected for the company's all-in-one desktop are thought to be minor component upgrades and processor speed boosts. According to a report from French Apple blog MacGeneration, Apple will roll out new iMacs at the tail end of next week. Beyond the tentative date, the site's source —who accurately predicted the recent MacBook Air update —had no further information as to what the refresh will entail. 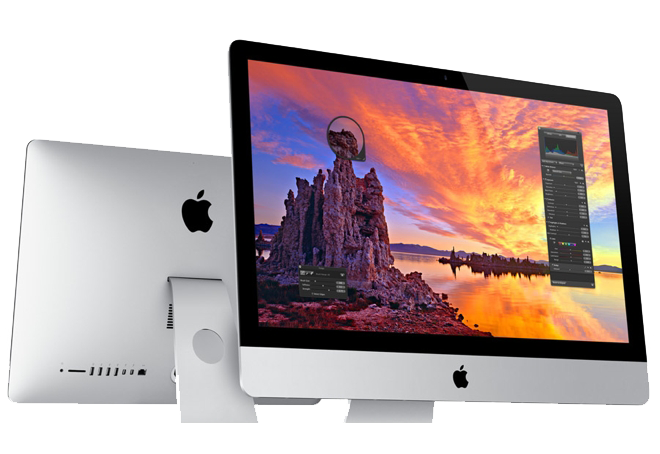 Without a big event or announcement, it is unlikely that a Retina display iMac will see release next week. Instead, the publication believes minor spec bumps like processor speed boosts are on tap, much like the recent MacBook Pro refresh in April. Fanning the rumor flames, code discovered in a recent OS X 10.9.4 Mavericks beta references two unrecognized iMac models identified as "iMac15,1" and "iMac15,n." Since current iMacs carry the identifiers "14,1," "14,2," and "14.3," the unknown models are thought to be next-generation machines. Intel also announced its Haswell product roadmap in April, which shows an average 100MHz speed bump for the CPUs used by Apple in the iMac lineup. The purported launch timing lines up with predictions from analyst Ming-Chi Kuo, who expects Apple to debut a low-cost iMac sometime this quarter. Apple usually draws down supply of existing channel inventory with a new release, though it appears stock is at normal levels at this point. Current authorized reseller availability can be found on AppleInsider's Mac Price Guide.